Through our many years of Autoclave refurbishment, the technicians at Booth Medical have acquired extensive experience diagnosing problems and repairing autoclaves. If you have an autoclave that is not working correctly, please follow the procedure below and we'll do our best to get you back up and running as quickly and economically as we can. 1. Contact us to discuss the problems you're experiencing. If you decide to have us take a look at your machine, we'll assign a repair ticket and instruct you on how to get your machine to our facility. At that time we will collect a non-refundable shop fee of $250.00 for the diagnosis and time spent to create an estimate. 2. Once your machine arrives, it will be bench tested and inspected to determine the exact nature of the problems. 3. The technician assigned to your autoclave will create a detailed estimate concerning the labor and parts required to make the necessary repairs. 4. You will be contacted to discuss the charges, and upon your approval, the repair work will begin. 5. If you decide that the repair work required is not something you wish to do, we will arrange for the return of your autoclave. 6. Once the repairs are complete, we will contact you to arrange return shipping and finalize the invoicing procedure. 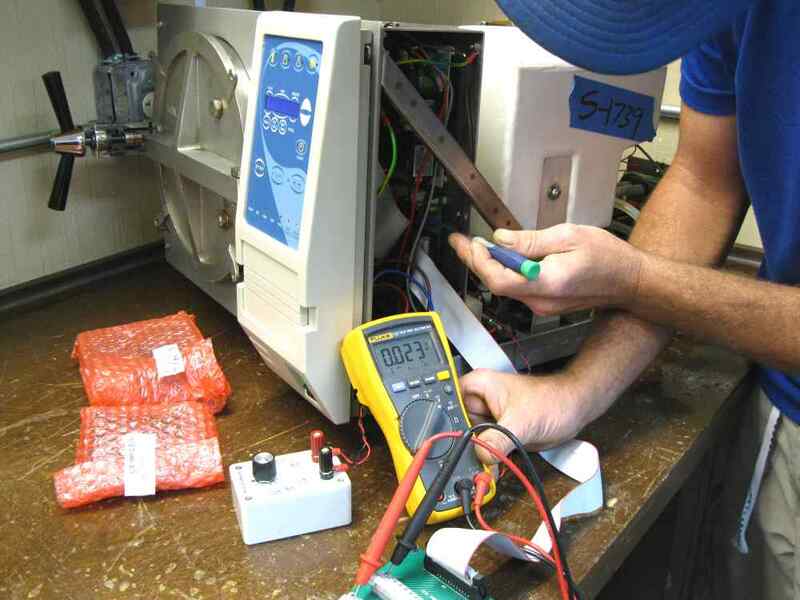 We carry an extensive inventory of repair parts on site to minimize delays. However, some parts which are not common are ordered directly from the manufacturer and may take a day or two to arrive. Our technician will also try and determine the cause of any problems and pass that information along to you to prevent similar problems in the future. Before leaving our facility, your unit will be thoroughly tested multiple times to ensure reliable functionality. The typical turn around time for most repairs is 2 to 3 weeks. Shipping might not be as expensive as you think. For example, a mid-sized autoclave that ships from Philadelphia to our facility are about $75.00 each way. If you are local to the Little Rock area, you can drop off your machine in the morning and get a repair estimate within a few days. If you do not have a box to ship your unit in, we can provide one for your unit for the cost of the box. The cost of the box depends on the model of the autoclave in question and the shipping destination. Improper packaging is the number one reason damage occurs in shipping. On many occasions, we have received machines with broken handles, doors or severe dents due to careless packaging. We will provide you with our recommended packaging guidelines, but any damage that occurs during shipping is between you and your carrier. At no time will Booth Medical assume responsibility for injuries that take place during shipping.